Let Midland Towbars Accessorise Your Vehicle with Roof Racks. 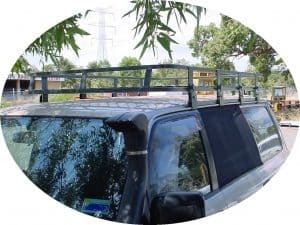 We at Midland Towbars have a huge range of durable and easy-to-use roof racks, awnings. We also stock luggage boxes, luggage baskets, roof bags, bike carriers, kayak carriers much, much more. With our huge range of products and our trained & friendly staff. You can rely on the team at Midland Towbars to transform your vehicle for work, play, or anything in between. We supply and fit a huge range of quality brands of roof racks and accessories including Tracklander, Rola, Thule, Red Dirt, and Rhino Roof racks. Come in and have a chat with us about what you are looking for and we will try and find the right Rack at the right price to suit your needs and your budget! We can get you everything you need – Isn’t it time you got organised for that trip you have been planning? Let us get you ready to hit those waves in style this summer with our comprehensive range of carrying solutions. Work better with our extensive range of work solution products including conduits and ladder systems and other accessories. Let Midland Towbars be your One-Stop accessory purchase shop! One philosophy of our business is that it must be easy to fit our racks to your vehicle! All the products we supply come with comprehensive installation instructions, making installation of your new roof racks and accessories easy for self-installation, saving you paying extra dollars for us to fit! However, if you want the convenience of our service, we can provide you with that quick installation service so you can quickly and easily set up and get your gear where you want it to be and get out there to work or play!